I don't know if the scenario I'm about to describe is only unique to beauty bloggers, but I find myself picking up items when they're on sale, and stashing them away for when I run out of whatever I'm using. Seems like a good plan, but all too often more products get accumulated between them and before you know it you've forgotten you even had it. Ugh. 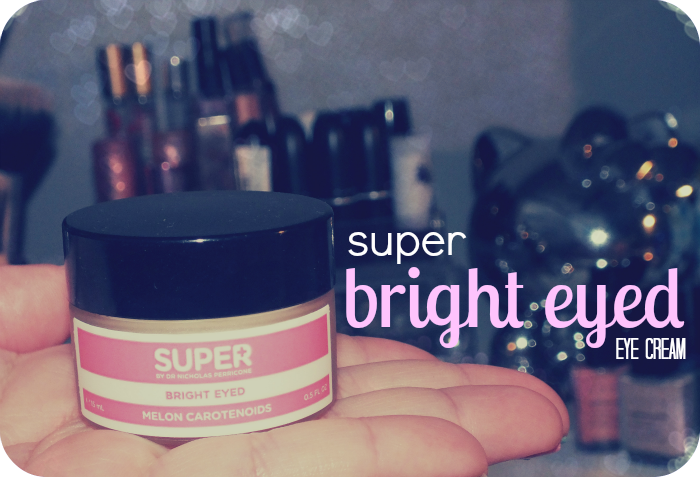 I ran out of eye cream a while ago, and ended up uncovering Super Bright Eyed in my stash. I picked up a set of Super products... a while ago, when The Shopping Channel first introduced them. When I started getting this post together I discovered it seems to be disappearing. I haven't be able to find out if it's full on discontinued or not, but it doesn't look like it's readily available. 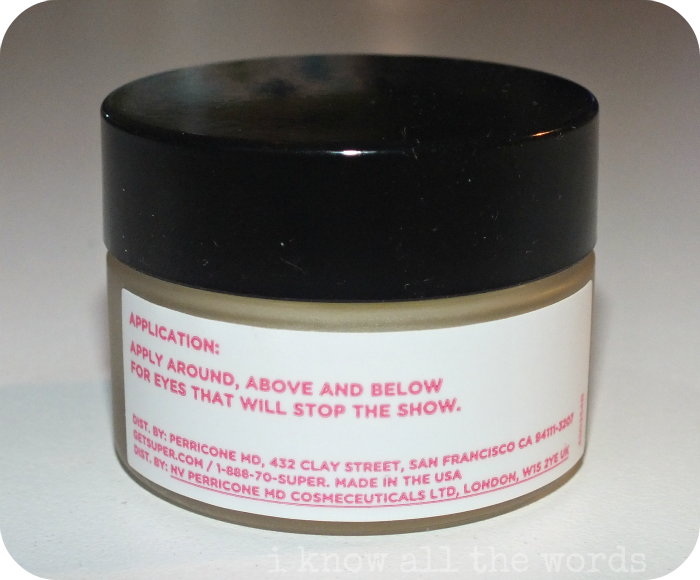 We all know there are ways to find anything (even if it has been discontinued) if you look hard enough, so I figured I'd continue on with my review. I sent Super an email to see what they had to say about availability, so I'll update as soon as I hear anything. UPDATE: I got a very nice email from Perricone MD. customer service, and the Super line has in fact been discontinued. Wah, waahhh. If you read I Know all the Words frequently, you'll know what I'm about to say. I don't tend to buy eye creams. 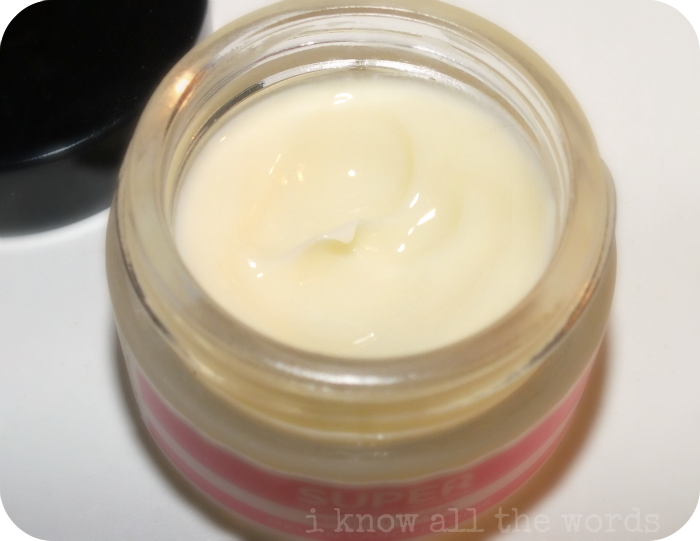 I love everything skincare related, but for the most part eye creams are just moisturizers put into itty bitty pots with an inflated price tag. BUT, I still get the urge every now and then, to give one a try (like this one and this one) and won't pass one up if it finds it's way to me. Like this guy did. It came along with it's Super relatives in a set. I don't think I'd ever shell out $52 dollars for a lone eye cream, but the set of three full size Super items was only $70, so the eye cream was almost like a free gift. Who doesn't like free? Evactly! Overall, I enjoy using this eye cream. 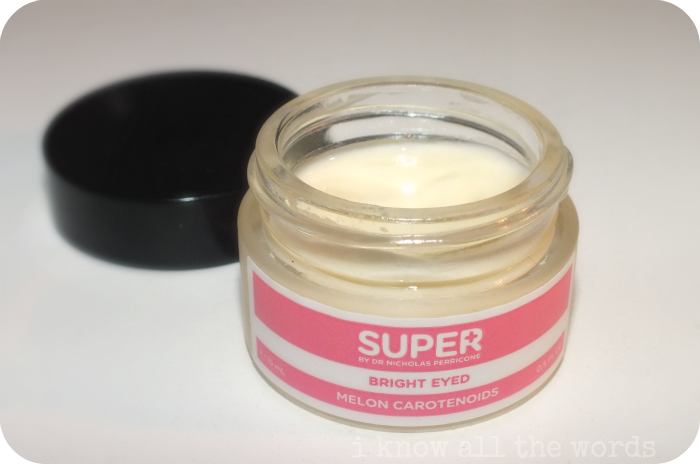 It moisturizes nicely and the smallest little dab is enough to cover your entire eye area, so this little pot will last quite some time, but I can't say that I'd ever repurchase at full price. I'd rather put that money into other areas of my skincare lineup. Do you use eye cream? Which one? Do tell!